More years ago than I care to admit, I presented a workshop at an MRID Fall Conference entitled, “So you want to be… a language model?” It was during the days when many programs were using the book “So you want to be an interpreter?” and was intended to address the reality that interpreters in classrooms not only provide access to communication but also model how to communicate. This pros and cons of this reality can certainly be debated; however, for many of us who work in classrooms, it is clear that our work impacts the language development of deaf, deafblind and hard of hearing students. Yet how we interpret affects more than language. Dr. Brenda Schick has focused in on the concept of “Theory of Mind” (ToM) to look at what receiving an interpreted education means for cognitive development – and this concept is an important one for us to understand as we approach our work in the classrooms and educational settings. So, Theory of Mind really is about a person being able to understand the complexities of the world – populated with people who do not always share the same thoughts and perspectives as oneself. Students need to learn to assess what other people know and believe as they navigate their environments. 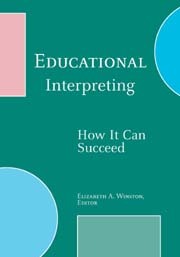 Brenda Schick, in a chapter in the book, Educational Interpreting: How It Can Succeed, explains how the developing of a Theory of Mind is related to educational development for students and how that can be impacted by receiving schooling through an interpreter. Schick argues that an important part of children developing this ability is to see how people talk about certain topics – recognizing that different people will display different emotions. Much of this information is conveyed not through the words spoken or signs rendered, but in the prosody of the messages. I often talk about prosody as the rhythm and flow of a language. It is included in the intonation and patterns that help demonstrate what is stressed,and gives us the clues to “read between the lines” and interpret the surface meaning of the text. Interpreters working with students developing a ToM need to be particularly aware of identifying who is speaking in the classroom, providing information about how someone is talking about the topic, and what might be the underlying meaning to the message conveyed by the prosodic nature of the discourse. Schick gives the example of a teacher “issuing a warning to finish seatwork by saying ‘It’s getting close to reeecceeesss,’ meaning ‘you may not get to go out if you don’t finish. '” Note that in this example, the teacher’s pronunciation of the word “recess” is elongated giving it a different meaning than is contained by the word on its face. If an interpreter doesn’t include that prosody, then a student would not have access to the actual meaning of the phrase. Now, here is one that tries to use prosody to show that this is not simply a statement of fact, but is in fact, the teacher urging the students to do something. How can we make use of this concept to improve our practice and the outcomes for the students we work with? Take the time to interpret classroom discussions and dialogue. Showing the diversity of people’s perspectives in any classroom setting, not only what different things people are saying but also the affect (emotional side) of any comments is important information to provide to students who are developing their Theory of Mind. Narrate informal discourse. Convey the gist of informal discourse happening during non-class periods. Who’s talking about what as they come into the room? Who mutters something right before they start the lab? What is do you overhear between the teacher and hall monitor or other staff you pass by? How do students ask to leave the room, borrow scissors, or decide what font to use on a report? Things don’t have to be interpreted word for word, but keeping the Deaf student in the loop about what we have learned to somewhat ignore in our readiness to “interpret” is extremely valuable information about how systems and people within those systems behave and make decisions. Make the implicit explicit. As we develop our own ability to convey prosodic information and as a student develops their own Theory of Mind, we may struggle to include all of this in our interpretations. Know that we have the option of sometimes making the implicit meaning more explicit. For example, in the above situation when the teacher is giving a warning about completing the “seatwork,” as interpreters we are not bound simply by the words spoken. One option is to sign what the teacher said and then unpack the meaning by signing explicitly, “MEANS IF YOU DON’T COMPLETE YOUR WORK, YOU MAYBE CAN’T GO PLAY.” This explicit interpretation helps provide support to a student in assessing the meaning behind what other people say. Developmentally – these types of expansions can hopefully be used less and less, but they can be important to scaffold a student to a more sophisticated understanding of the world. Use Pre- and Post-Assignment Controls: Dean and Pollard’s Demand-Control Schema provides a great framework for us to approach our work. Important in this is the notion that in addressing demands, we do not only need to act in the moment, but can also prepare for and use time after the work to address a demand. So, if you have a relationship with a student where you have direct interaction with them, you can prep them for how teachers or students talk before a class – or debrief a conversation afterwards helping explain how people say something – and in what context – may affect what they actually mean. As someone who works on my own Theory of Mind, I realize that the last suggestion may raise some people’s eyebrows. (Is this really the responsibility of an interpreter to do this?) Educational teams should have input on how best to support the cognitive and linguistic development of students. I humbly suggest that educational interpreters can be a part of that conversation and are also potentially a part of the solution. View more information on Gallaudet University Press web site. Schick, B. “Social Cognition and Theory of Mind,” on website of Hands and Voices. Retrieved on December 20, 2016 from http://handsandvoices.org/comcon/articles/socCogTheorMind.htm. Thanks to Patty Gordon for her suggestions on this article.